LinkedIn is one of the top social networking websites with more than 100 million users to date. Impressive, right?! With a goal of bringing people together for professional reasons, LinkedIn uses a few different options that allow you to create your very own professional network, such as finding past and present working colleagues and/or classmates to connect with, looking for new jobs, and the ability to ask industry experts their advice on a particular topic. The main purpose for using LinkedIn is to establish a professional profile in order to connect with other people that have professional interests similar to yours. There are a few membership options for you to choose from, with the more you pay the more services you’ll receive. When first starting out, you may want to start with the basic (free) account as a way to get your foot in the door to see exactly what LinkedIn offers. If you find that you are satisfied with the services that come with a basic account, there’s no need to spend the extra money. If you decide that you would like to take advantage of the extra services and perks than the basic account offers, then you have the option to upgrade. Free. Receive a free, basic account. Business. $19.95 a month and up. Business Plus. $39.95 a month and up. Executive. $74.95 a month and up. As with any type of upgrade, the more you pay the more perks you get. These perks are by and large aimed towards professionals who are looking to hire employees, so to help you figure out whether upgrading is worth the extra expense, you should ask yourself a few questions that can assist you in determining which LinkedIn plan is right for you. 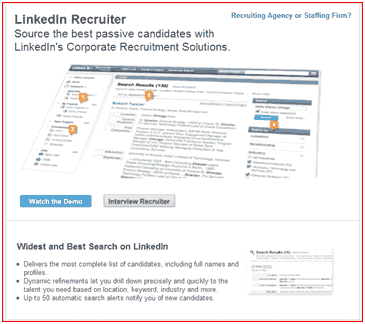 –What is the main purpose for wanting to join LinkedIn? –How often do you expect to use LinkedIn’s services? –Are you looking to hire people? Find a particular group? Start a new business? More Profiles. More profiles are available to you when searching through the LinkedIn database. 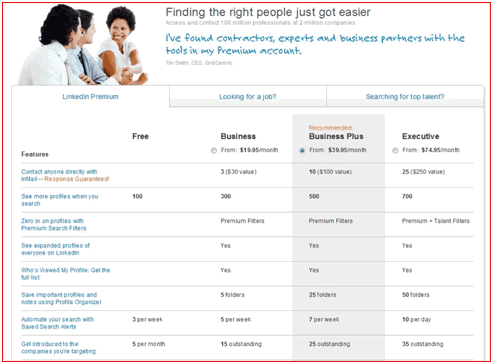 The basic account allows you 100 profile searches, Business is 300, Business Plus is 500, and Executive allows you to access up to 700 profiles every month. Profile Organizer. Lets you save and manage files with ease by allowing you to place all your important profiles in one easy-to-manage workspace folder with the ability to add notes and contact information. InMails. 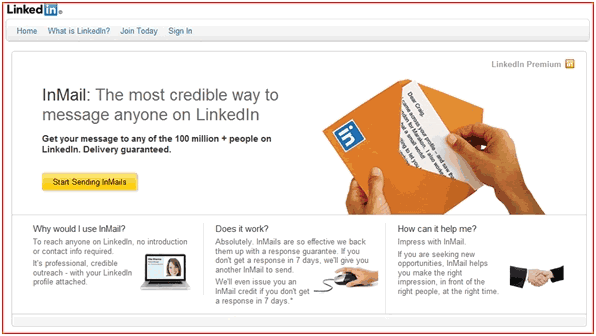 An internal email system that allows you to contact anyone within the LinkedIn community. One of the best perks is the ability to send a message directly to another member without having to have a formal introduction first. This is really great because otherwise you would not be able to contact that member at all without being formally introduced and as a result are now connected. If you’re not already part of the LinkedIn network, know that it is really easy to join. Simply sign up with your name and email address and you’re ready to go! 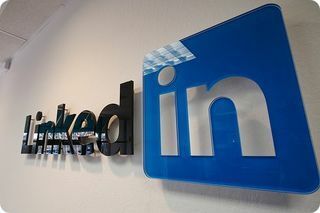 They’ve also recently revamped the site, giving users some really great features that they can now expect to receive when joining the LinkedIn community. Follow these steps for setting up your professional account in order to receive optimal results. List your past and current jobs. List all of your educational endeavors. Add your photo to help establish credibility to your profile. Optional-use webmail import to see who you may already know. Optional-upload your current contacts, from Palm, Outlook, etc. Job Title. Create a captivating title that says more than just “Owner” or “Manager”. Also, add a descriptive name to your title that lets people know exactly what it is that you do. Summary. Be concise in your summary. This is where you get to condense everything you do into a short marketing message. Make sure you include some good keywords of products or services that you offer. Specialties. This is a great place to add your products and services with good keywords that people can use to find you. Adding in good specialties allows you to be found in relevant searches. Recommendations. These are always good for credibility. A great way to get more recommendations is to recommend other people in your network (honest recommendations). As you do that, you’ll find that people will return the favor. By joining LinkedIn, you are opening yourself and your company to so many endless possibilities! On one hand, you will find people that are just starting out in the world of business and are trying to get their foot in the door, while on the other you will see that about 30% of LinkedIn’s members are either business owners, senior managers and/or C-level executives. So whether you need to hire someone for your business or are looking to contact a high-level executive in a particular company, you are able to do so by joining the LinkedIn community. You are promoting your business when you join LinkedIn when you set up your account. All your business information will be displayed for all to see when they visit your Company Page. Looking for that next super fantastic employee? Simply post a job and let them come to you. –As of January 2011, LinkedIn counts executives from all 2010 Fortune 500 companies as members; its hiring solutions were used by 73 of the Fortune 100 companies as of March 22, 2011. –More than 2 million companies have LinkedIn Company Pages. –LinkedIn represents a valuable demographic for marketers with an affluent & influential membership. –Thousands of developers are using LinkedIn APIs to create innovative tools and services for professionals. LinkedIn may be a little confusing when you first start but it’s definitely a site you should be focusing some time on. When you look at all of the social media sites, this is the one that is squarely aimed at business people. Good luck!